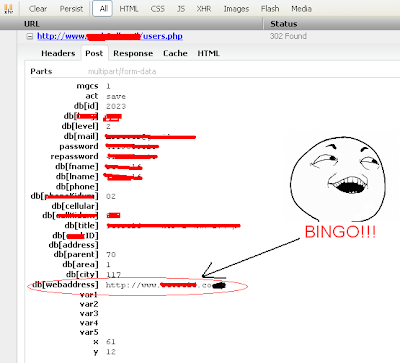 Home » website hack » How to exploit CSRF vulnerability(CSRF tutorial)? Today, I'm going to explain you about WEB vulnerability that not everyone knows...but it very popular.This vulnerability is very dangerous and effective.Usually, the vulnerability exploiting never leave evidences.This vulnerability called: Cross Site Request Forgery(CSRF).CSRF and the way to exploit it is extremely easy; Much easier then all the complicated injections. Make sure that the slave have SESSION \ COOKIE on the target site. Actually, In order to cause the slave to perform unwanted actions he is not aware of, the slave must be logged to the target site with cookies and verified by the browser \ server. Image tag does not require clicking the link compared Tag-A requires clicking on the link to activate the HTTP request. Also, CSRF attacks can be implemented not only through websites but through email messages. Since the mail boxes allow sending data to HTML format, the attached image perfectly legal. In this case I can send a malicious email message to huge amount of recipients, put a photo tag email body when the SRC contain a malicious link, when the slave opens the email, the desired action done. Here a cool example that actually belong to Black-SEO. What I want to check in my user control panel is the parameters are sent as a request to HTTP server when I'm updating my home page via the user control panel. There are a variety of fields that can be updated, such as address, phone, email, name, content, and most importantly for this example: The favorite website\home page address. These parameters are sent to the server using POST method. So we do not see the parameters in the URL address. But, if the parameters will be written via GET method, the data will sent? Let's see. site:targetsite.com & intext:"Homepage" & intext:"email: "
There are not many hermetical familiar solutions to prevent CSRF attacks. Since the tokens are defined, the attacker can not know what is the token of the slave, because every loading of the page the token will change to other random number\string. Don't forget to delete your cookies. When you built your php site, don't use GET \ REQUEST super-global variables. most of srilankan web sites are vulnerable to CSRF. thanks for this blog guys . . .. . . . .
Is it vulnerability If CSRF Token travel in URL on Post Request, Can we have any exploitation on this. anyone help me on this. As you have seen, patching existing code or creating non-vulnerable code can be really time consuming. Nevertheless, CSRF attacks can cause serious business impact if successfully deployed. That's why it is imperative to guard our web applications against cross site request forgery csrf attacks. wow..... what a great blog. nice sharing. I like this blog. thanks for the sharing information about vulnerability protection scanning.